In a previous post, I shared how simple it is to make homemade pasta from home. 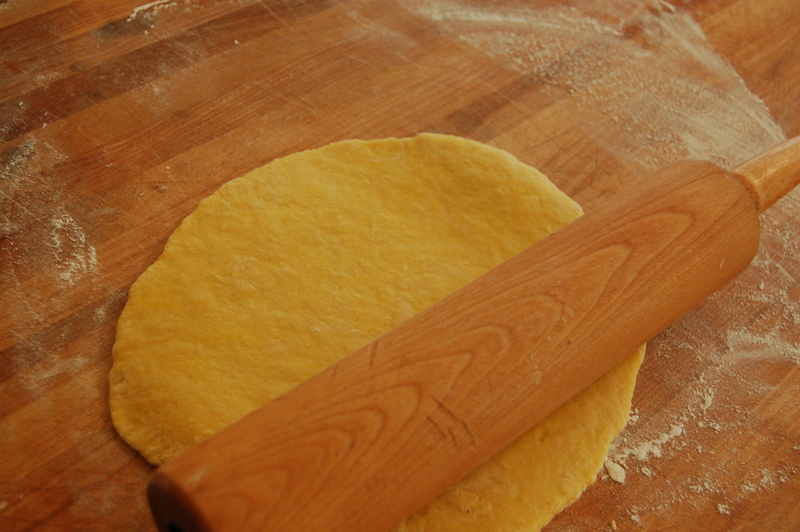 It doesn't require much but a rolling pin, a large surface to roll the dough and a knife. Making Farfalle (or bowtie pasta) is especially fun and really only requires one extra tool - a fluted pastry cutter. You can get one online for around $5. 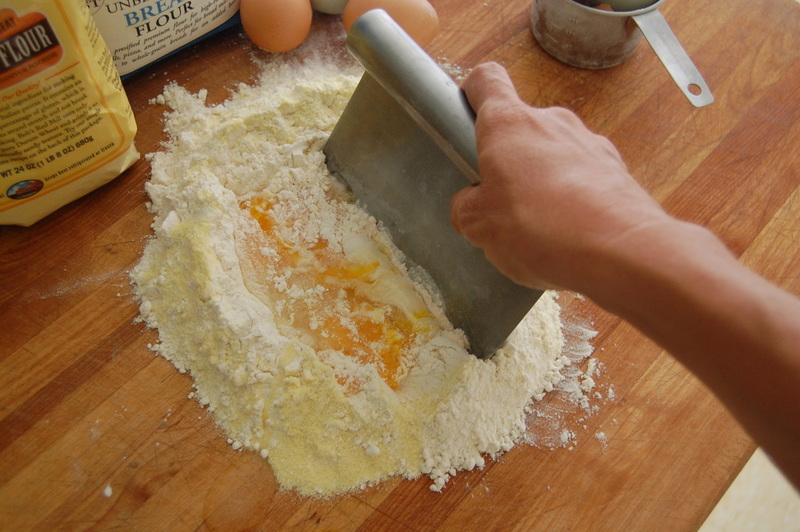 First, make your dough (simply crack a few eggs into a pile of flour on your counter or cutting board). Mix well, knead until smooth, wrap with plastic and let it rest for 30 minutes. 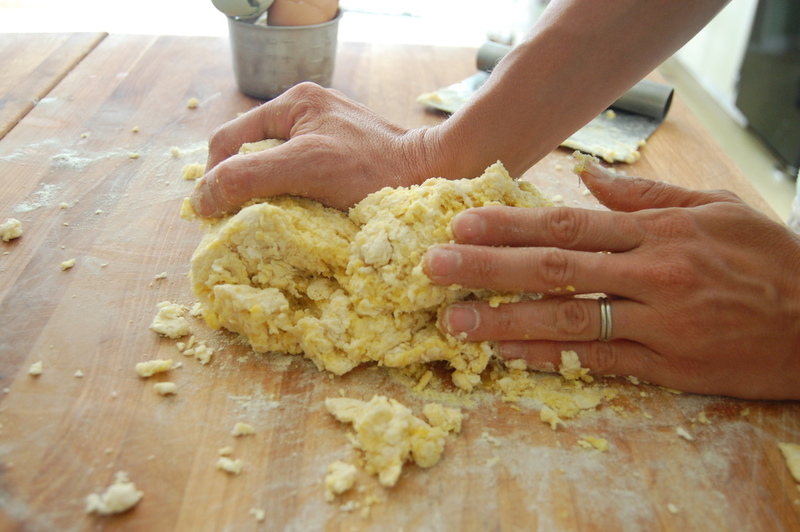 After your dough has rested in the fridge, divide your ball of dough into 2 or 3 pieces and begin rolling it out. Try to get it as thin as possible using the rolling pin. Pick up the piece of dough and flip it over each time, sprinkling a bit of flour if it's sticky. Keep rolling it until it's about as thin as a coin. 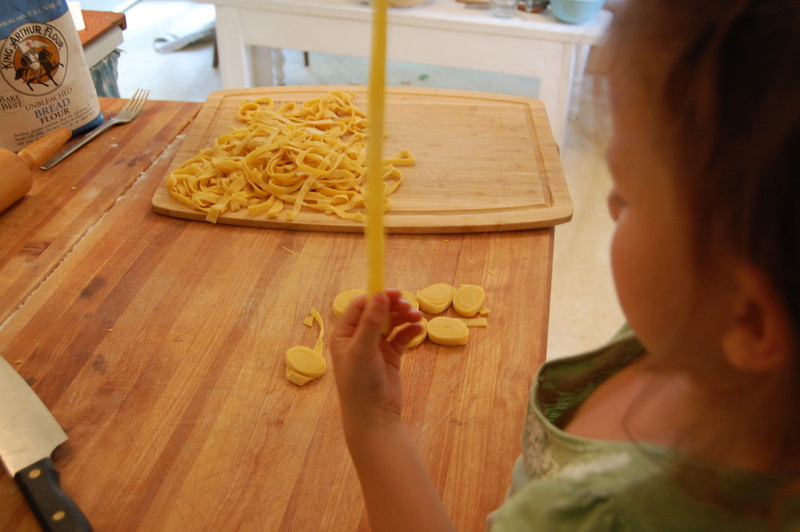 (If you have a pasta roller - you can use it to get it extra thin, but it's not necessary). 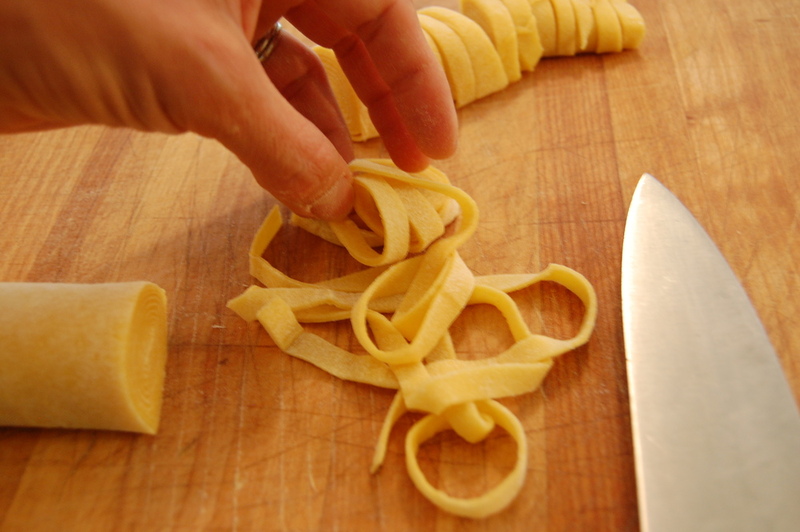 Once your pasta has been rolled out very thin, cut long strips with the pastry cutter - about 1 1/2 inch wide. Next, cut the strips into rectangle shapes, and pinch at the center. So simple and fun! Kids love to get their hands in on this part! Lay the Farfalle out gently and bring a large pot of salty water to a rolling boil. Cook until just al dente, drain and serve with your favorite sauce. I dream of traveling to Italy. The land of my maternal heritage holds such a strong personal draw for me. Italians find immense pleasure in growing, cooking & eating food. We delight in the process - and seem to value knowing where each ingredient comes from. In my own imagination... all other Italians can relate to stopping after that first bite of food (that which you took part in growing, cooking & serving) and getting a bit teary eyed at the wonder of it all. 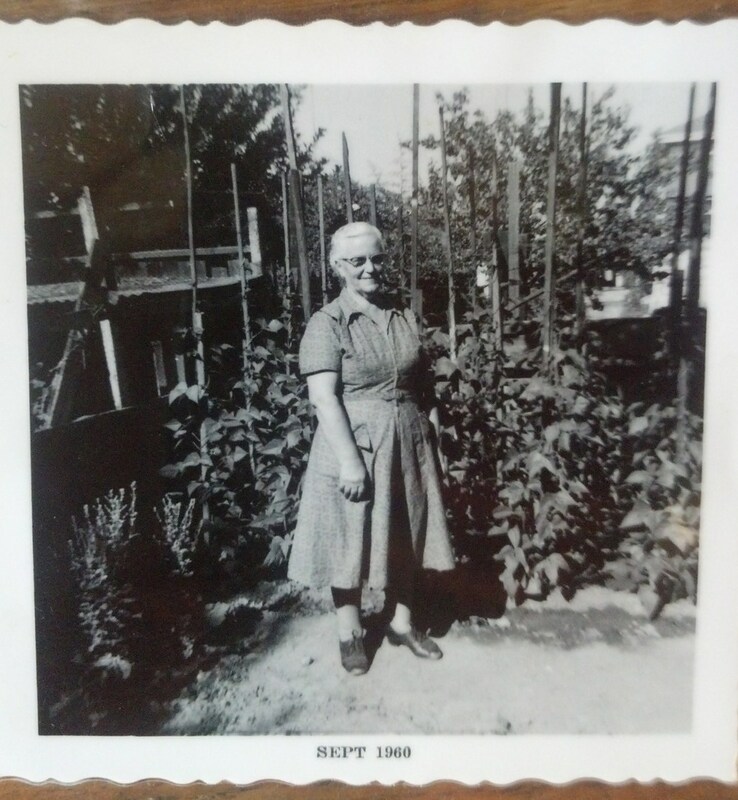 Below is a picture of my maternal grandmother - Marina Scarpenti - standing proudly in front of her green beans. And me in my garden, the first year we dug up the lawn. Until then, I find great joy in creating simple dishes that remind me of something Grandma Scarpenti might have made. Home made pasta is an experience. Why go to the trouble? Because it is completely different than dried pasta... and for me - the process of making it from scratch is romantic - and it connects me to my roots. The process is also quite simple. All you need are eggs and flour. In Italy - they use Tipo '00' flour - which is very finely ground. In my local searching - Bread flour is comparable. It's very finely ground. Also, blend in some Durum Wheat Semolina. This contains high levels of gluten to make it elastic. I like to make a 'well' on my cutting board with the flour. Then, crack in some beautiful fresh eggs. But eventually, you have to get your hands into it... Afterall, your hands are your best tool. Wrap it in some plastic to keep from drying out - and let rest for 30 minutes. You've worked the gluten in the dough nicely, but now it needs to rest so that you can roll it out. Otherwise, it will want to shrink back up, and will be difficult to roll thinly enough. After it has rested, begin rolling. You want to get it as thin as you can. I pick mine up, flip it over, dust it with a bit of flour if it's still sticky and keep rolling. Then, take your large sheet of nice, thin pasta and roll it up gently. Taking care not to squish it. 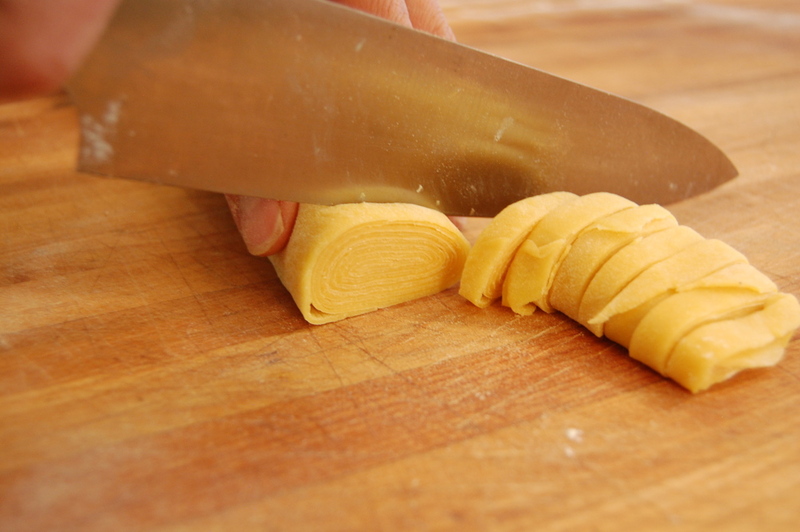 With a sharp knife - cut your pasta to the desired width. Gently unroll each piece and set it aside to wait while the water boils. Bring a BIG pot of water to a boil while you are making your pasta. Salt the water generously. It should taste salty. This is important. You will only need to boil this fresh pasta for a couple of minutes. Taste it and don't over-cook! Here is a quick lunch I made the other afternoon when I didn't know what to make. I was out of a lot of things... but I DID have eggs and flour. This batch was made with bread flour and (freshly ground) whole wheat flour. I sauteed some garlic in some bacon drippings, then added chopped broccoli leaves (and a few florets) from the garden - salt and pepper and some grated hard cheese... perfetto! Simple yet delicious. If you want to watch another Italian making pasta - you'll love watching Gennaro Contaldo make pasta dough. And seeing how quickly he can roll it out. If you have dietary restrictions - just adjust the flour type you use. The other night, I made three different pasta doughs to suit my guests. I will admit - the traditional recipe was the best. But I love the fact that it's possible to adjust things for those in your life whom you love. Everyone loves to twirl up a bite of pasta. I'd love to know if you give this a try!